My last two blogs I have been explaining how to set up your tenant for External Sharing, and as a user how to share a document to an external user. At the end of my last blog post I explained how you can view which documents have been externally shared, by navigating to Site Usage and viewing the Externally Shared tab. However, as stated previously, this section is flawed in a couple of ways. It relies on Search. Meaning that documents may not show up for a while. It only shows documents that have been externally shared, and the external user has viewed the file. This is because there is a flag (ViewableByExternalUser) on the file that gets updated, only after an external user has viewed the file, not when you have shared it. Following on from the last point, your site could have lots of documents externally shared, but you would never know if no one externally has viewed the file. The above ‘Externally Shared’ tab and search call, although it can bring back documents, it wasn’t what my client really wanted. They wanted to know straight away if the document was externally shared or not. I emailed Stephen Rice (Product Manager for SharePoint and OneDrive for business) at Microsoft, and he said there wasn’t a current way of tagging the documents if they were externally shared at the time of sharing the document. The ViewableByExternalUsers is only updated when the user enters the document. What I couldn’t understand was when I click the Info Panel for a document, if it was externally shared, it would state that the item was shared with guests. This was before an external user access the document. Using Chrome network capture, I investigated what happens when the Info Panel loads up, and one call caught my attention. This call is made via a POST call. Looking at the Preview response and digging further down into the results that returned, the permissionsInformation section contains all the Sharing links, and groups and users that the item is shared with. Contains an array of link results. This includes internal sharing links, anonymous links and external links. Created & CreatedBy – When the link was created and by who. 6 – Flexible – Used in External Sharing with email address. The invitation sections gathers the information about the person who doing the inviting ‘InvitedBy‘ and who has been invited “invitee”. You also have the exact time and date when the invite was sent out. I have discovered that the linkMembers only has values after the external user has visited the link. The principals results are the groups and members that have access to the documents. If the external user has been previous added to your tenant via a site share, or document share before December 2017, then they will have an actual account in your tenant. Anything shared with them will show up here, instead of through the Shared Links. The Paul Matthews shown in the screenshot below is actually my personal email address and therefore an external user. The principal contains the user or SP Group information. For users (principalType 1) this includes if they are external or not. The last section showed you all about the GetSharingInformation REST API call. It has to be done with a POST call, but apart from that, it does obtain all the Sharing Information in regard to that item. The only one thing I would say it is lacking is that if a SP Group that is assigned to that document had an external user in it. (For example, the members group, because you have externally shared the site) the isExternal flag on the principal of that group isn’t set to True. Now knowing about GetSharingInformation REST API call I was able to create a SPFX field customizer. My next blog post will show you how I built the SPFX field customizer. Continuing from my previous blog “Externally Sharing – Settings within SharePoint Online” which shows you the different configuration settings within your tenant to enable External Sharing, this blog post is showing from a user perspective how to share, and from the external user’s perspective on the email they receive and how they sign in. From a document library/list, a user can easily share a document/folder with an external user. Click on the document that you wish to share. From the dialog, select the drop down. Select Specific people, optionally untick Allow editing if you only wish to give read access. Put in the email address. An email will be sent to the user. To find out who the document has been shared with, click the tick next to the document, then open the information panel. Under Has Access, click Mange Access. If the user you have shared with, is found within your tenants directory, they will be added as a person to the manage access section. (Cliff K) in screenshot above. If the external user is not found in your directory, then a link will be created. (The top link in the screenshot above). By hovering your mouse over the image below the link, will show you who that person is. An external user will receive an email from no-reply@sharepointonline.com. Please Note: The email might be in the users Junk Email. The external user will need to click the link. They will be taken to a page, where they need to verify that it is them. The external user will need to click the Send Code button. An email will be sent to their email address and be given a code. Please note: This email could also end up in the Junk folder. The external user will then gain access to the file. What documents are externally shared? Unless you are the only user on the site, you will not know what documents have been externally shared. There is a way to see what documents have been externally shared for a given site. Along the menu bar click the Site Usage button. Then click the Shared externally tab. This will display the externally shared items. Although the above shows you which documents are externally shared, it is flawed in a couple of ways. It only shows documents that have been externally shared, and the external user has viewed the file. This is because there is a flag on the file that get’s updated, only after an external user has viewed the file, not when you have shared it. 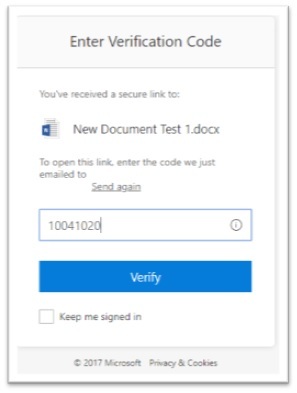 This blog post has described how you would share a document with an external user, and how that external user would then gain access to the document. Lastly, I have shown where you can view which documents have been externally shared, although it isn’t great. My next post will be more development focused, and explain how I’m able to work out if an item has been externally shared or not. It is possible to share content from your SharePoint environment to external users. These users are not part of your tenant. They might have their own tenant within their company, or they might just be a person with a personal email address, such as a live.com or gmail.com. There are few setup steps within your tenant to allow/disallow external Sharing. By navigating to your SharePoint Admin Center, https://<tenant>-admin.sharepoint.com on the left hand side of the screen, there is a sharing navigation link. This takes you to the ExternalSharing.aspx page. This part of the page you are able to disable externally sharing completely, or open it up granular. If you have previous shared in the past (especially before Microsoft changed how the External Sharing worked – Dec 2017), or shared a entire site with an external person, their account get’s put into your Organisation as a guest account. Having this option on, will continue to allow sharing with those people, but prevent new external users to be shared with. Allow sharing to authenticated external users and using anonymous access links. This options completely opens up the external sharing. Your users can externally share with anyone, without without requiring the external user to authenticate. With anonymous sharing, you also get the option to expire links after x number of days, and you can set the access link types that get sent out to users. By setting Files or Folders to ‘View’, this will mean every anonymous external link sent out will always be read only. If set to ‘View and Edit’ for files or ‘View, Edit, and Upload’ for folders, that allows the person who is sending out the anonymous external link to decide if they want to apply Read only or Contribute permission for the link. If your organisation wanted to only allow a group of people to externally share, here they can do that. This can be done by using individual people names, or even with an AD group. What is nice here, is if you don’t trust a group of people to allow anonymous sharing, you can also assign a different group of people to allow anonymous sharing. When someone selects a document/folder and clicks on the Share option you can default the link type, so the user doesn’t need to switch each time. Here you can set the default permission of either view or edit when someone creates a sharing link. This isn’t just for external links, this applies to anonymous, internal and direct links. If your company is quite security conscientious, setting this to View is a good idea. As stated on the page, these settings do not apply to anonymous access links. Limit external sharing using domains (applies to all future sharing invitations). If your company only works with a couple of 3rd party companies, and your documents shouldn’t be shared with anyone else, this is a good option to use. Here you can ‘whitelist’ domain names to send to. Prevent external users from sharing files, folders, and sites that they don’t own. Once you have externally shared your document to someone, do you want them to then be able to share onto someone else that you haven’t authorised? If not, then ensure this is ticked. If it their own document that they have uploaded/created that will be able to share that. External users must accept sharing invitations using the same account that the invitations were sent to. When you send an link to someone, by having this option selected, they will only be able to sign in using the email address you sent the invite to. This option selected can also cause problems if you send the link to someone personal email, and they also have their own 365 account, as their 365 cookie token can get picked up, and they receive the error message that the account they are using to sign in with is not the same account the invite was sent to. Require recipients to continually prove account ownership when they access shared items. Once the external user has logged in once without this ticked a cookie is put on their machine to allow them access to that document again without require to re-authenticate with code. These notifications are for when sharing using One-Drive for business. You can optionally select if an email will be sent or not for the following 3 options. Other users invite additional external users to shared files. External users accept invitations to access files. An anonymous access link is created or changed. There is also a configuration page for OneDrive external sharing. Go to the OneDrive admin centre. Click the Waffle -> Admin. Under Admin centers click OneDrive. Then on the left-hand navigation, click Sharing. Note that these setting when changed here, will affect the settings you set in SharePoint Admin centre for Sharing. So, change something here, then head back to the SharePoint Admin Centre sharing page, and the changes will reflect there. However, there is one setting here, that isn’t in the SharePoint Admin Centre sharing page, and that is OneDrive permissive sharing. The above sections allows you to set the Sharing settings for SharePoint different to OneDrive. In the above screenshot, I’ve allowed Sharing (not anonymous) in SharePoint and prevented any external sharing in OneDrive. Please note: You cannot set the OneDrive to be more permissive than SharePoint, As stated underneath the sliders. In SharePoint Admin Center in the Site Collections, you can change some of the tenant sharing settings just for that give site collection. Select the site collection you wish to change and click Sharing in the ribbon. At the site collection level, you are able to choose a option for Sharing outside your company, as long as it’s less permissive than your tenant settings. Here you can create either a blacklist to block sending external sharing links to certain domains, or ‘whitelist’ a bunch of domains so that external sharing can only go to them. By going to the actual root site, there is one more place where you can affect sharing settings. This is the Access Request Settings. Site Settings -> Site Permissions. Then Access Request Settings in the ribbon. There are 3 settings here. With this ticked, members can share. However, with this just ticked they cannot share the site. When a user tries to share the site the Share button clicks but nothing happens. With this unticked you are turning off sharing for everyone except for Owners. Allow members to invite others to the site members groups. With this ticked. Any user that is part of the Members group will be able to Share the site. It doesn’t matter if a user has permissions in the site, say in a different group, unless they are part of the members groups, they will not be able to share the site. With this ticked and with an email address put in place. When a member attempts to share a site, an owner must allow the access. Requests can be found at: Site Settings -> Access requests and invitations. In this blog post I have explained the different areas where you can set up Externally Sharing in your tenant/site. In my next blog post I’m going to go through the steps as a user, sharing documents/folders with external users and the steps the external user goes through to sign in.